Real Madrid forward Cristiano Ronaldo said the decision to suspend him for five games is "persecution". 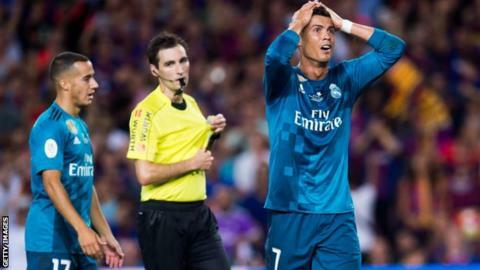 The 32-year-old failed in his appeal against the ban for the red card he received in Real Madrid's 3-1 win against Barcelona in the Super Cup. Ronaldo will miss Wednesday's second leg and will not return to domestic action until 20 September against Real Betis. However, he will be able to play in the Champions League. In an Instagram post, after his failed appeal, he wrote: "It seems to me exaggerated and ridiculous, this is called persecution." Madrid had signalled their intent to appeal against Ronaldo's second yellow card shown for diving eight minutes from time when he went down inside the area under pressure from defender Samuel Umtiti. The forward was only on the field for 24 minutes as he was introduced as a second-half substitute and fired into the top corner 10 minutes from time to give Madrid a 2-1 lead. It was Ronaldo's 10th red card of his career and the two yellow cards on Sunday came within two minutes. "Once shown the red card, said player [Ronaldo] pushed me lightly as a sign of his disapproval," the referee Ricardo de Burgos Bengoetxea wrote in his post-match report. The message they've got to send out is it's unacceptable to push a match official. If I'm walking down the high street in my town I can't go pushing a policeman. There is nothing to excuse what Ronaldo did. We cannot accept this at any cost.